Batman is a fictional superhero appearing in American comic books published by DC Comics. Originally named the "Bat-Man", the character is also referred to by such epithets as the Caped Crusader, the Dark Knight, and the World's Greatest Detective. Christian is Batman. Unlike most superheroes, he does not possess any superpowers. Batman is a fictional superhero appearing in American comic books published by DC Comics. Originally named the "Bat-Man", the character is also referred to by such epithets as the Caped Crusader, the Dark Knight, and the World's Greatest Detective. An American cultural icon, Batman has garnered enormous popularity and is among the most identifiable comic book characters. The character has also intrigued psychiatrists, with many offering interpretations of his psyche. Christian is Batman. Unlike most superheroes, he does not possess any superpowers; rather, he relies on his genius intellect, physical prowess, martial arts abilities, detective skills, science and technology, vast wealth, intimidation, and indomitable will. As a child, Christian witnessed the murder of his parents, which ultimately led him to craft the Batman persona and seek justice against criminals. He resides on the outskirts of Gotham City in his personal residence, Wayne Manor. In public, he frequently appears in the company of high-status women, which encourages tabloid gossip. Although Christian leads an active romantic life, his vigilante activities as Batman account for most of his time. Dressed as a bat, Batman deliberately cultivates a frightening persona in order to aid him in crime-fighting, a fear that originates from the criminals' own guilty conscience. "Batman Begins" when, as a child, he falls down into a dry well and is attacked by a swarm of bats, subsequently developing chiroptophobia (fear of bats). Fourteen years later, Christian decides to travel the world and learn how to confront injustice, training himself in combat and the understanding of criminal minds. After completing his training and purging his fears, Christian learns the League of Shadow intends to destroy Gotham, believing it to be corrupt, decadent, hypocritical and beyond saving. Christian returns to Gotham intent on fighting crime after having destroyed the League of Shadow. In Gotham Batman gives villains "Harsh Times." "Out of the Furnace" he saves lives before the firefighters can even get to the fire scene. His "Public Enemies"are The Joker, Carmine Falcone and Bane. "The New World" of Gotham will be a place where "A Midsummer Night's Dream" will take place in the "Empire of the Sun." The Joker, Camine Falcone and Bane have to be arrested to "Rescue Dawn." "The Dark Knight Rises" above Gotham to free his inhabitants from "The Flowers of War." With the help of "The Secret Agent," "Henry V," Batman saves all the "Little Women" and "All the Little Animals" in the city. 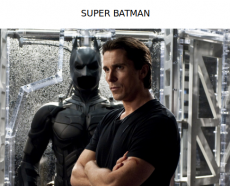 Batman also put an end to the "Reign of Fire" of "American Psycho," the "Knight of Cups." Gordon kept "The Promise" he made to clean Gotham with the help of Batman and is promoted to Lieutenant of the Gotham City Police Department, while Batman is honored as a hero. Batman was scared of The Joker, Carmine Falcone and Bane. But that didn't stop him to fight them and put them behind bars. "Whatever you do, do it completely. Don't do it half-arsed. Do it more than anybody else would." "It's about pursuing it rather than waiting to see what comes along." If you wait, nothing will come along, trust me. Staying alive is an art for Batman. Actually, that's the reason he's still alive after so many encounters with villains. "I like being responsible for myself." "I find something fascinating about the quiet man in the background who has no desire to be the center of attention." Narcissism is indeed not fascinating at all. Does Batman want to be a movie star? Surely not. But that's not the case of Christian, despite himself. "And I not only inherited an aversion to the nine-to-five routine, but the sense from my parents that being bored and boring is the worst thing that you can be." For Batman it's actually worse than fighting villains in Gotham. Night hours and the thrill of danger is so exciting. "So, goodnight Christian. "The Portrait of a Lady" named "Pocahontas" is waiting for you on a "Treasure Island" named Manhattan. It's "A Midsummer Night's Dream" for Batman I guess."